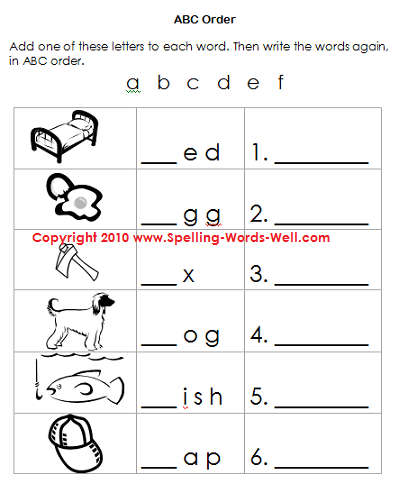 Here's one of our favorite free phonics games. It provides a fun way for your early learners to practice long vowel sounds and spelling, if you like. Read the rules below, then click on the printable link and get started! If you'd rather practice short vowel sounds, we have a game for that, too! 1. Print out the game board and answer key. Laminate, if desired. 2. Players 1 and 2 choose a color. Player 3 is the checker. 3. Player 1 rolls the dice. She looks at the key at the bottom of the game board. She identifies a word with that vowel sound on the game board. For example, if she rolls a 2, she looks for a word with a long e sound (sheep, bee, key, tree). If she correctly identifies the word, she covers it with a marker. 4. Player 2 rolls the dice, finds a new square and proceeds as described above. 5. 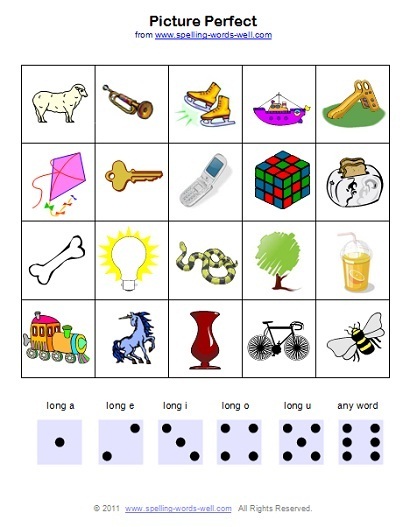 If a player rolls a 6, he may choose any picture that is not covered and tells its vowel sound. If he is correct, he puts his marker on it. 6. If a player rolls a letter sound for which there are no more pictures, his turn is over. 7. The game ends when all the squares are covered. The winner is the player with the most markers on the board. Play the game as described above, adding that the student must also spell the word correctly after identifying its vowel sound. 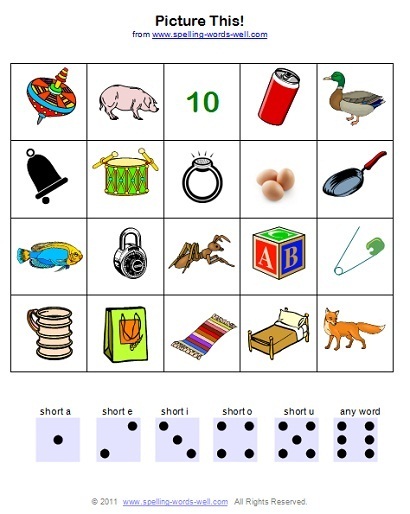 For more practice with long and short vowel sounds, try these free phonics lesson plans!